New to Chennai? Do you often say ‘um, no’ (which is completely okay) when you’re asked if you’ll bring a +1 to an event (probably because you want someone to go with)? If you’re looking to meet new people and make new friends, here are a few places that will hitch you up fast. This is a great place to meet new people because there’s a selection system - this guarantees you’re gonna meet Chennai’s most amazing bunch! Sofar Sounds (Songs From A Room) is a world-wide concept of hosting intimate gigs in a secret venue and is popularly known for being a hub to bring new people and make friends. So, cosy up, dim the lights, and get friending. Awkward with sustaining conversations? No worries, the music is a good distraction. There are loads of board game communities popping up in the city, and GGEZ is one which welcome everyone from students to veterans. Chennai Board Gamers, which has over 750 members on their FB page is also one of the popular clubs where you can roll the dice and let the cards to the talking. The stand-up scene in Chennai is exploding - so much that it’s become the first place to go to get a date or make a new friend. These nights happen regularly in venues across the city; the most popular one being BAY 146 in Savera. Stand up shows happen every Sunday and attract people from various backgrounds, so this is the perfect place for you to tickle the funny bone and make a new friend. Read people like an open book at Human Library, which has reading sessions and lots of sharing experiences. These sessions are conducted regularly and you might just find someone who loves the same book or author as you do and so begins the conversation. This organisation hosts events to showcase some of the most underrated works of local artists. Every event is different and they showcase different forms of art - story telling, music, films, etc. The events begin with short introductions and there’s always time to hang out and chat after. So, if you’re looking for a no-pressure zone to make friends, this one’s for you. Even though it’s known as an ‘anti-cafe’, meeting people doesn’t get easier than this. Walk into Backyard and we guarantee you will make at least five friends, and that’s just on a weekday! They host various events, shows, and workshops across diverse categories, so you can meet people with different kinds of passion. It’s got a very homey vibe too, so it’ll feel like making a friend at home. As the name suggests, this venue attracts loads of wanderers. Meet all kinds of artists, musicians, and innovators here and talk shop about everything from the right kind of socks to the yummiest desserts. You know what they say; it’s the wanderer that finds their soul. Wandermile literally creatines memories and connects people by curating travel experiences. So, just by signing up for a one-day trek you’re going to meet loads of people. No better way to getting to know someone from scratch than travelling, so pack your bags and get ready to go! If you want to expand your social circle but are a bit shy, head to one of the open mic events in the city. They are very frequent and are held at quaint cafes which will give you cosy vibes. You don’t necessarily have to speak, but you will meet loads of people who are there to listen. So, go with the flow and see what happens - chances are, you’ll bump into someone equally shy and strike up a conversation. 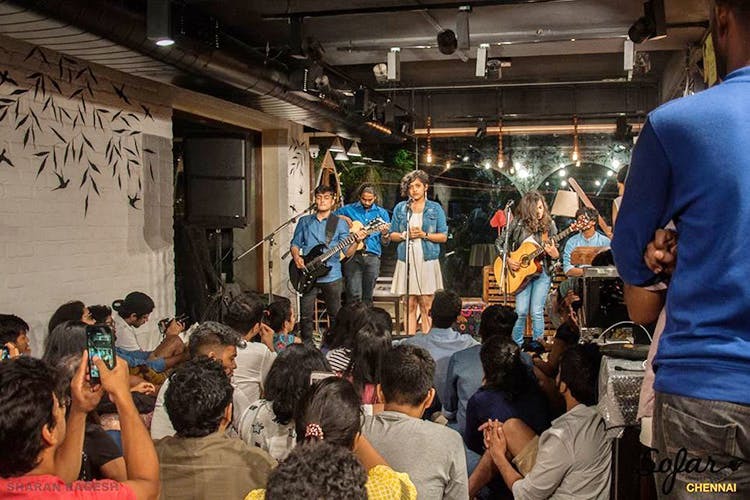 Another space which connects people through music and art, Trooze is a paradise for Chennaiites looking to meet new peeps. Here, you can watch upcoming indie song writers live and there are interactive sessions to talk about the performance, too. So, Trooze your way to a new friendship!